The evocatively named Lake Panic is overlooked by a thatched, rustic style hide in one of the most delicious settings that a birder is ever likely to encounter. 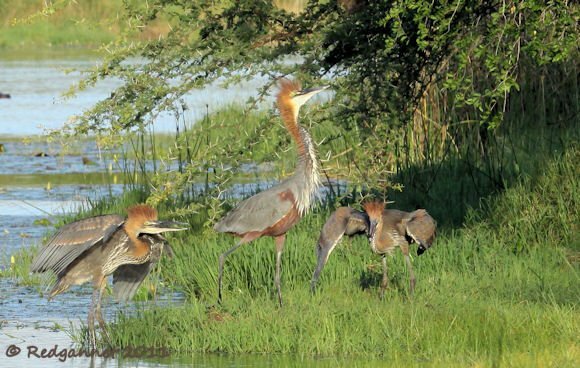 The bird life of Kruger National Park appears to be distilled into a small area surrounding the hide and they seem oblivious to the observers with their battery of lenses poking out from the wooden building. The hide is situated at the top end of the lake (Google Earth ref; 24 58 53S 31 33 58E) as the bank sweeps round and blocks the main body of water from view. 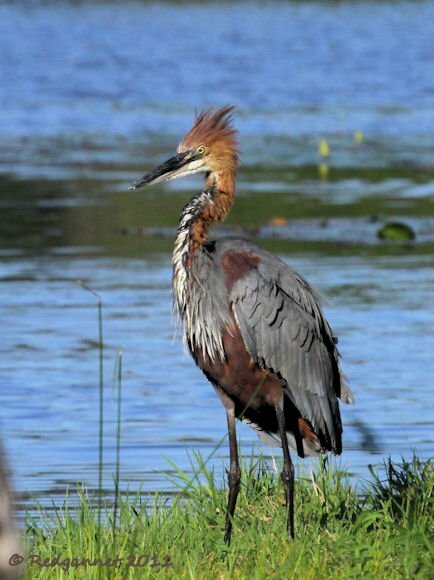 This means that the opposite bank is very close here and on each occasion that I have visited, a Goliath Heron took centre stage on the facing bank, posing reflectively. Today an adult bird was hunting while two juvenile birds waited, knee-deep in water, apparently unclear what to do next. The adult bird had had some success and stopped hunting in favour of a dip. I cannot say whether it took the plunge to cool itself off in the heat of the afternoon or if it was hoping to achieve a cleansing or parasite-ridding effect. Back on the bank it gave itself a doggy shake to dry out and held its feathers slightly raised from its body to help them dry, making itself look even bigger than it already was. 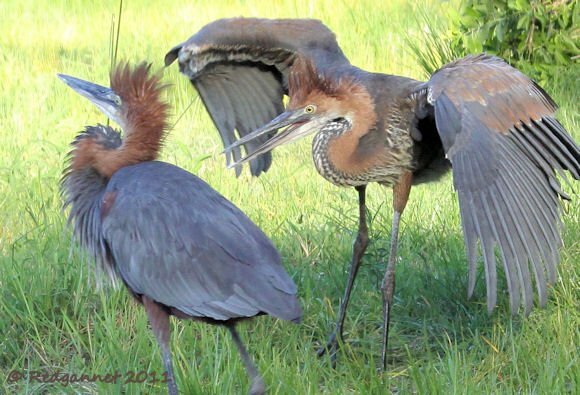 As the name suggests, the Goliath Heron is the world’s biggest member of the Ardea family. 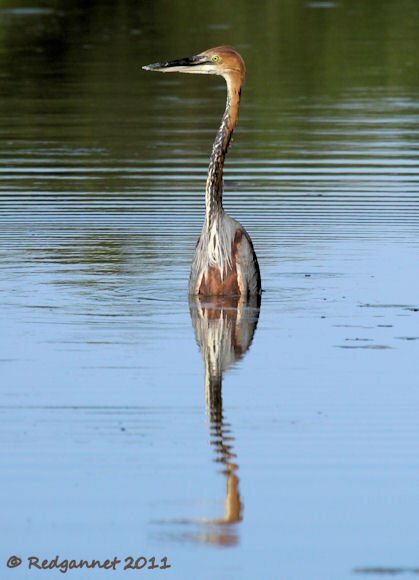 Using the ubiquitous Great Egret as a reference, the Goliath Heron is half a meter taller (from bill-tip to toe) and four times as heavy. 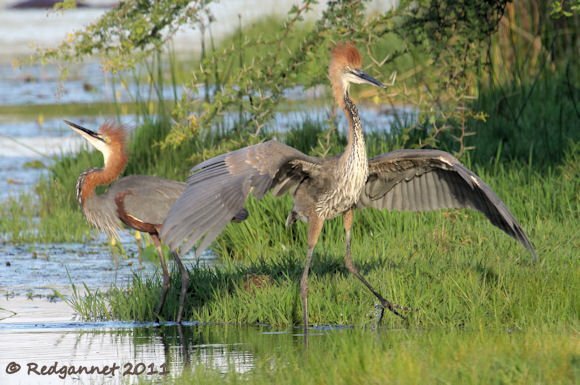 For this reason it needs huge wings, outspanning the Great Egret by a meter. Even so it sometimes struggles to get airborne and always looks very heavy in flight. The hero of our piece today, having eaten his fill and had a bathe, took himself into the shade for a rest, leaving his offspring to fend for themselves as the afternoon wore on. 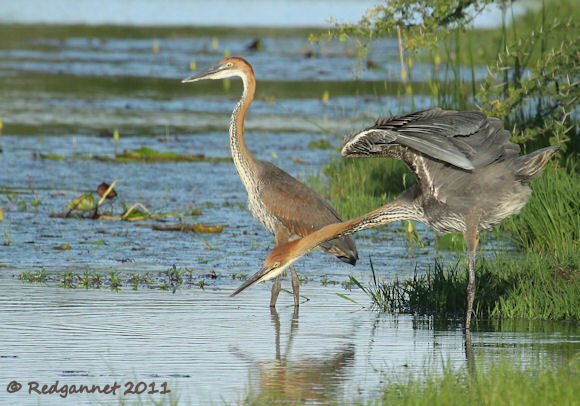 The heron has a very sedentary style of hunting which left me wondering if the youngsters had quickly grasped their parents’ technique or whether they really had no idea what they were supposed to be doing. Occasional stabs towards the water never broke the surface. The forward thrust of the neck caused a recoil in the body making the attempt fall short of its target and leaving the young heron looking rather sheepish. Eventually the parent re-emerged, immediately attracting the attention of the two juveniles. One was especially excited and adopted a very submissive posture in an attempt to get the adult to feed it. For no good reason I took the two birds to be father and son. Perhaps it is the association with impatient, hungry boys who are always first to the table and the fact that the assumed dad revelled so much in the attention that was being afforded him. Adult birds can be told from the immature birds by the block of colour on their bellies. It is usually described as chestnut, though to my eyes it looks almost maroon when compared to the warm brown of the head and neck. The immature birds have dark streaks running down onto a pale belly. The strutting action of the very self-important parent could have been a physical attempt to regurgitate some part digested food for the frantic juveniles, but it really looked as if he was soaking up the adulation of his offspring. 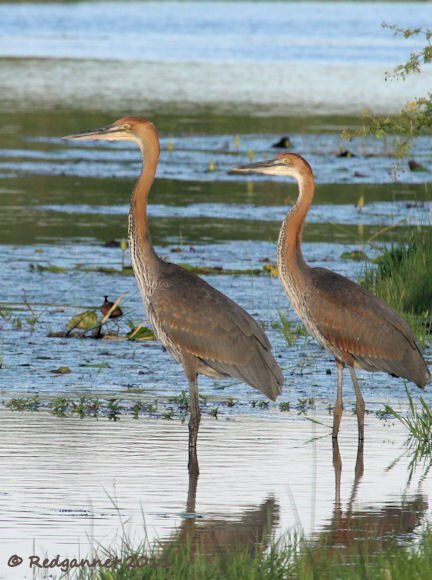 The clutch of a Goliath Heron would usually consist of 3-4 pale blue eggs that would hatch after about 4 weeks. Chicks are fed by both parents who continue to feed them after they leave the nest in their third month. Raising two chicks to this stage is a reasonably good return on investment. After yakking up some fish soup for the greedier of his two offspring the parent took a well deserved drink of water while the second youngster complained that she (who had been patient up ’til now) had not yet been fed. With both youngsters fed, calm returned to the bankside and the sun began its dive for the horizon. Other bit-part players tried to steal a little limelight while it lasted, but dusk comes quickly here and shadows began to reach out across the water. Lake Panic is a glorious place to spend an afternoon, just sitting, just watching, just enjoying. If you liked this post, why not explore the gallery section at 10,000 Clicks? Love this post, the photos, all the information. Beautifully and thoroughly depicted here. Thanks for the smile and the educational fun post! Lake panic is an awesome place-the sounds of the hippos combined with the African jacanas and many other birds as you sit in the hide watching malachite kingfishers come in to a close view -magical! First there in August 2010, will return in August 2012. 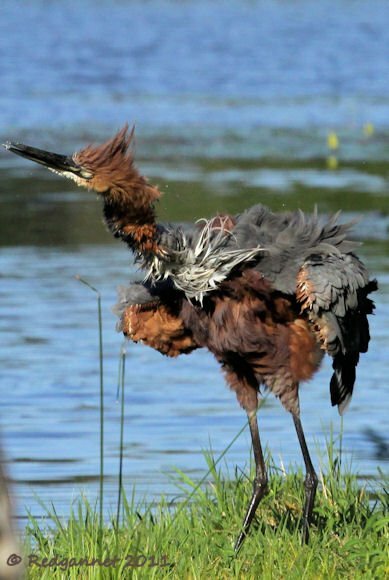 Kruger nat’l park is amazing for birding. Also for mammals. If you ever get the opportunity, go! Fantastic pictures! Never even knew this bird existed…Thanks! 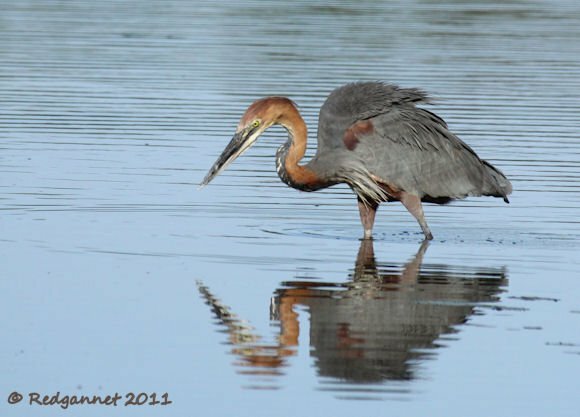 A goliath heron was my very first bird. I went to Sabi Sands on safari and one was hanging out right outside our room, in the river. First bird I looked up in a field guide, and I still have a picture of it on my wall, standing in the river next to a full-grown male buffalo. It’s a hilarious picture, it looks like some sort of pygmy buffalo next to a normal-sized bird. 🙂 It’s the last picture on this page, there’s also a picture of the heron looking majestic in the sun. THanks for posting this, it brought back wonderful memories!